A freighter navigates the American Narrows in the St. Lawrence River. 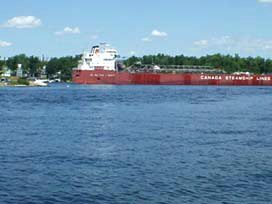 The U.S. Army Corps of Engineers wants to embark on a $20 million study to look at expanding the St. Lawrence Seaway's locks and channels, but they first need Canada's support. Photo by David Sommerstein. The St. Lawrence Seaway is a major economic engine for the communities of the Great Lakes. ports on both sides of the border say it’s important to update a system that’s almost fifty years old. Keith Robson is president and CEO of the port of Hamilton, Ontario. year could float into ports such as Hamilton, Duluth, Toledo, Chicago, and Detroit. shippers rely on the Seaway to handle 70 million tons of cargo a year. Canada sees problems in the Corps’ approach. interest groups on both sides of the debate to speculate. the scope of the study beyond shipping. Reg Lanteigne of the Canadian Shipowners Association says the delay is just a bureaucratic one.